A Tom Savage touchdown pass to WR Jaelen Strong put the Texans ahead, but Tom Brady, Rex Burkhead, and three Stephen Goskowski field goals put the Patriots up in the early third quarter. However, a Deshaun Watson touchdown run in the late third quarter and a D’Onta Foreman touchdown in the fourth quarter gave the Texans a lead, and victory by a final score of 27-23, Texans over Patriots. With that we give you our PFF exclusive takeaways from the contest for each team. Making the start despite being signed by the team just last week, Ellington had a nice debut in a Texans uniform. Texans quarterbacks had a 118.8 passer rating when targeting Ellington Saturday night, as he hauled in four of five targets for 93 yards; Ellington caught both of his targets for a total of 48 yards — including a superb catch along the sidelines — when he was being covered by Malcolm Butler. Savage once again moved the ball effectively with the first-team offense as he connected on eight of his nine pass attempts. Savage was a perfect 3-for-3 when blitzed on Saturday night for a total of 20 yards and a touchdown. The game-ball selection for the game went to Kamalu after scoring a sack, three additional QB pressures, and a mighty healthy 12.5 pass-rushing productivity over 26 pass-rushing snaps. 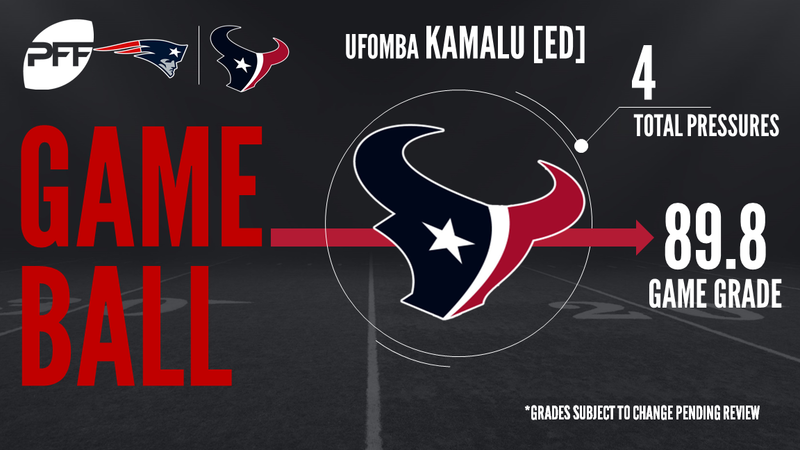 Kamalu would also collect three tackles (zero missed) in run defense that enabled him to cruise to the second-highest run-stop percentage (20.0) of preseason Week 3 at his position. Washington didn’t quite match the overall grading of Kamalu, but made a valiant effort nonetheless. Washington did his damage on pass-rush snaps from the left edge, resulting in a sack, a QB hit and an additional pressure. For his efforts, Washington scored a 9.6 pass-rushing productivity that ranked him with the 20th-best such output from preseason Week 3 among 3-4 outside linebackers. The Patriots’ offense controlled the clock throughout the game, but ultimately came up short on several promising drives. No need to hit the panic button in response to Brady’s performance, as the offense was clearly not at full strength, and the situation should be chalked up as a shaking-off-the-rust narrative. In fact, Brady was quite crisp with the majority of his throws, but the minimal snaps (16) couldn’t erase the damage from a pair of errant throws. On the plus side, Brady came under pressure twice while on the field, and found RB Rex Burkhead on an underneath route for a 22-yard catch-and-run into the end zone. As with Brady, Burkhead’s evening was snap-limited and, despite the aforementioned receiving touchdown, found very few seams to work on the ground. Burkhead saw the majority of the first-team snaps, and closed out the contest with an excellent 12.5 yards per receiving route run on four snaps in route. In total, Burkhead collected each of his three targets for 50 receiving yards. Butler allowed receptions on all four of the balls that were targeted into his coverage for a total of 59 yards and a touchdown. Jaelen Strong had him off-balance on an in-breaking route for his touchdown; Texans QBs had a perfect 158.3 passer rating when targeting Butler’s coverage. Langi started the game and led the Patriots defense with 48 defensive snaps played on Saturday night. The undrafted free agent’s three stops tied for the team lead and he also chipped in three pressures (all hurries) on 29 pass-rush attempts.